Christmas Cookies and Holiday Cheer! On Sunday 4th December we sang at Haslemere Christmas Market. This is a fun yearly event in Surrey where they close the high street and transform it into a Winter Wonderland where you can shop, eat and be merry! We sang for all the lovely Christmas shoppers as they came in for a coffee and a much needed rest! We had a brilliant few hours helping everyone get in the festive spirit! 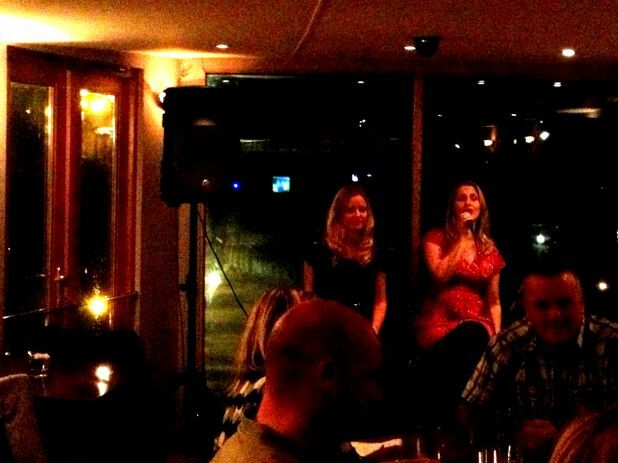 On Friday 9th November we were asked to sing at the rather picturesque Barge Restaurant in Maidstone, Kent. It is a really unusual, quirky restaurant set on a barge on the River Medway. They have recently started live music evenings and we were delighted to be asked to come and sing. We have never had such a beautiful view to sing to! We sang a mix of our jazz classics and some more contemporary tunes to suit everyone's taste. We had a fabulous evening chatting to people who were enjoying our music and we look forward to becoming a regular fixture there in the New Year! "Thank you Nightingales for a great night last night." Natasha, The Barge Restaurant. On Sunday 21st October we had the pleasure of singing at Miss Vintage Wedding Affair. The wedding event took place at Battersea Arts Centre in London. We were singing in the fabulous pop up tea room to all the brides and grooms as they drank glasses of proscecco and ate chocolate and raspberry cake! We have to say that this wedding fair was filled with the most beautiful exhibitors displaying some stunning vintage wedding supplies. We met some great people and loved having our picture taken in the pop up photo booth! If you are having a vintage styled wedding or holding a vintage event and need some fabulous entertainment get in touch with us! Two Princesses and a Castle! On Sunday 7th October we were lucky enough to sing at the beautiful Whitstable Castle in Kent. It was a stunning sunny autumn day and we had the pleasure of singing for lots of engaged couples. We chatted to many of the Brides and Grooms inbetween sets and are very much looking forward to singing at some of their weddings next year. We are also pleased to announce that we are now to be listed as a chosen supplier for Whitstable Castle weddings and events. We look forward to singing again there in February. For more information about the wedding packages we offer CLICK HERE. On Thursday 27th September we sang at The Bell in Godstone, Surrey. It is a stunning vintage inn with cosy log fires and a really homely feel to it. We were thrilled to be asked to sing at the first live music event they have held there for a couple of years. We sang a mixed repertoire of music ranging from some of our Natalie Cole classics to our jazzy versions of recent pop songs to a packed bar and restaurant and had a really great evening singing for everyone. We look forward to returning again soon.